Contact Friedman Rodman & Frank, P.A. Car accidents can be some of the most challenging events people ever experience. But when a negligent driver does not have insurance — or doesn't have enough insurance — the experience can become a nightmare. At the South Florida law offices of Friedman, Rodman & Frank, P.A., we offer strong advocacy and legal counsel to victims hit by motorists with little or no insurance. We also provide aggressive representation to hit-and-run accident victims. We will apply our many years of experience and legal skills to help you obtain compensation for the damages you have endured. 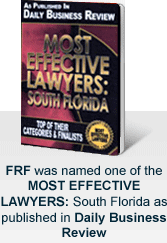 Contact our law firm today to meet with a highly skilled Miami underinsured motorist attorney. If you were hit by a motorist who did not have proper insurance or is underinsured, you likely feel overwhelmed and unclear how your expenses will be covered. We will act quickly to identify potential sources of recovery. We are available to evaluate your insurance policy to determine if it includes uninsured/underinsured motorist coverage. This would allow you to recover compensation up to the limits of your insurance policy for your past and future medical expenses, lost wages, pain and suffering and any property damages up to the limits of your insurance policy. We can also explore the possibility of stacking uninsured/underinsured policies to increase your recovery options. This would be in addition to what you recover from the party at-fault party. Insurance policies can be complicated. Even if your insurance policy includes uninsured/underinsured coverage, your insurance company may try to refuse to honor the policy or limit the amount you are compensated. This is a roadblock we are fully prepared to overcome. Our law firm has a strong background going head-to-head against insurance companies and will not hesitate to pursue a bad faith insurance claim, if necessary. In addition to an uninsured motorist claim, Florida's no-fault auto insurance laws mandate that your insurance cover the first $10,000 of your medical expenses — regardless of fault. Stacking underinsured/uninsured policies allows you to multiply your available coverage based on the number of vehicles on your policy. This would allow you to recover additional compensation up to the limits of your policy, regardless of fault. We are committed to identifying every opportunity possible for you to recover compensation for the damages you have endured. If you were run off the road or hit by an unidentified motorist, we will advocate to protect your rights. Our legal team offers a strong background conducting investigations to determine the identity of hit-and-run motorists. We will evaluate the police report and will meet with any eyewitnesses to try and gain any leads. When valuable, we can also consult accident scene reconstructionists to help us try and identify the at-fault driver. However, in some situations, at-fault drivers, unfortunately, cannot be identified. We then act quickly to help hit-and-run accident victims recover compensation through pursuing an uninsured/underinsured motorist benefits claim. We also identify other sources of recovery through Personal Injury Protection benefits. We want to help you obtain the compensation you need to rebuild your life. Our door is always open for personal injury victims. We truly fight hard to recover compensation for victims of uninsured or underinsured accidents. To discuss your options with an experienced Florida uninsured motorist attorney, contact us online or call 305-448-8585 or toll free at 877-448-8585. We are available 24 hours a day, seven days a week. All consultations are free and confidential. Highly recommending Carolyn Frank would be an understatement. Being careful as to whom I would give my case to as I had dedicated most of my adult life to one company. I needed someone who would work for me, value my case and my needs. Carolyn Frank and her valued staff met all of the above. From the first meeting I knew I was in the right office. Her knowledge, professionalism and what I would soon find to be outstanding dedication to my case from her and her staff were second to none. Marcos G.
Mr. Friedman was my choice after a dog bite attack. Him and his firm took on my case in a very professional matter without lacking empathy. I felt like he and his team personally cared for me and they kept me up to date on every step of the process. The outcome was great and I am very happy that I have chosen them. I already have recommended them to my friends and family and if you are looking for legal support I highly recommend a meeting with the firm. Any first time consultation is free, ( to my knowledge). So what do you have to lose. Give them a call! You'll be in great hands. Nora N.
Caroyln's expertise and compassion got me through a very trying period of my life. She is an excellent lawyer and human being. 5 Star all the way! Lois H.
I met Carolyn Frank about three years ago. Once I met her I knew she was the attorney I needed to handle my case.When we met with her the first time we were there for at least two hours. When I left her office I knew she was the right person to handle my case.At that time my case was 22 years old and I needed someone who knew what they were doing. This was a complex case and it fell under the Long shore Act..There are not many attorneys that handle this type of case in Florida. Mike P.
We serve the following localities: Fort Lauderdale, Hallandale Beach, Hollywood, Lauderhill, Margate, Miramar, Oakland Park, Pembroke Pines, Pompano Beach, Sunrise, Broward County, Immokalee, Naples, Golden Gate, Collier County, Fort Myers, Lee County, West Palm Beach, Palm Beach County, Doral, Golden Glades, Hialeah, Homestead, Kendall, Miami, Westchester, Miami Beach, and Miami-Dade County. Copyright © 2018, Friedman Rodman & Frank, P.A.